Continuous nationwide blockade was ongoing by 18 party alliance groups including Jamaat, to demand a stop to the torture by Awami League against the leaders and workers of the Islamic Movement and demand for the non-partisan government. 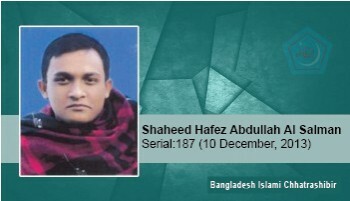 In the meantime, on Thursday, December 10, 2013, the government declared Abdul Quader Mollah's execution date, and the whole country erupted in protests. People came down on the streets. In this spirit, protests and demonstrations began at 9pm in the city of Feni. The armed police fired indiscriminately at the peaceful protest procession. Shaheed Hafiz Abdullah Al Salman, who was shot on the left side of the chest, passed away on the spot.